….and the 2018 season promises to be one of the best. Especially at Steinhatchee, in southern Taylor County! Consider hiring a professional guide to put you on a quick limit of tasty bay scallops! We’re always cautious to put out information in advance of the season, and now, by July 1, we’re certain that this year’s scallop harvest at Steinhatchee will be one of the best in recent years. This year, however, the rules and regulations for the bay scallop harvest have changed somewhat. 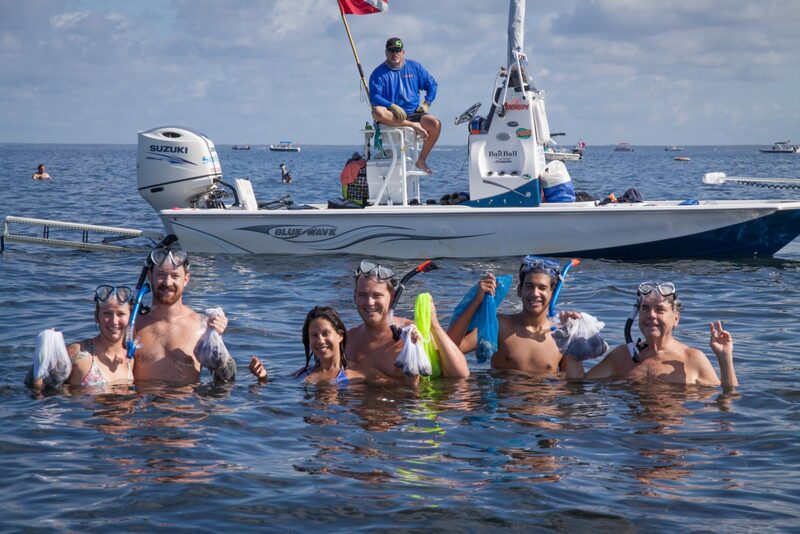 Essentially, Taylor and Dixie counties, the sites of our best grass flats and best scalloping, have seasons that are open from June 16 to September 10. Only northern Taylor county and Wakulla County have different season dates. That information can be found on the FWC’s bay scallop page You’ll also find information regarding bag limits and diving / snorkeling rules there. The scallop-rich grass flats in northern Dixie County and southern Taylor County are best accessed from either Steinhatchee or Jena, near the mouth of the Steinhatchee River. Driving from the north, the towns are best reached by SR51 from US19 or from Mayo on US27. From the south, the best route is CR358, which intersects US19/98 abut 10 miles north of Cross City. The area regularly attracts visitors from the Tampa Bay area, Gainesville/Ocala as well as south Georgia. There are three established marinas alongside the Steinhatchee River. River Haven Marina is upriver, past the bridge. It’s a full service marina, with a sling-type launch for customer boats. 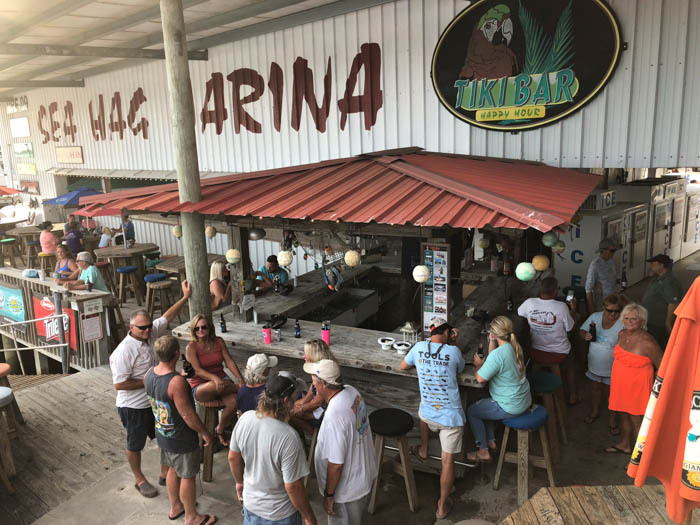 The also have a tiki bar, dockage, fuel and rental rooms. Good Times Marina has motel rooms, a boat ramp for guests, fuel, dockage as well as an excellent restaurant. The Sea Hag Marina is the closest marina to the Gulf. It offers full marine services, a tiki bar, fuel, lodging and boat launching with a forklift. All three marinas offer rental boats, but we advise you call to reserve boats in advance. 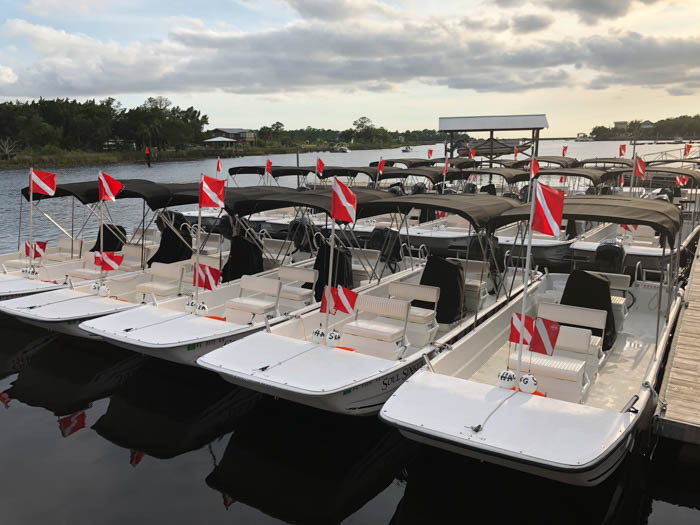 If you don’t have a boat, and don’t want the responsibility or expense of renting one, consider hiring one of Steinhatchee’s many fishing guides==most are listed on the marina websites. 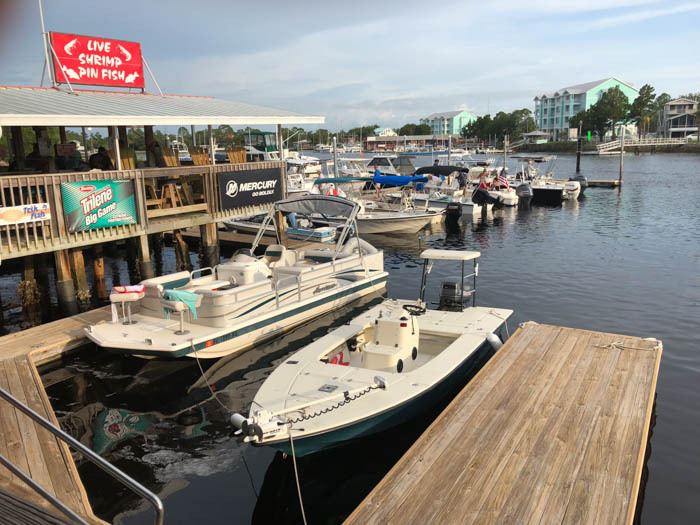 Dockage at Steinhatchee’s marinas can be filled, so please call ahead regarding available space. The rental boat fleet of 23 boats at the Sea Hag Marina is fully equipped for snorkeling. See http://seahag.com/rental-fleet/ for details! 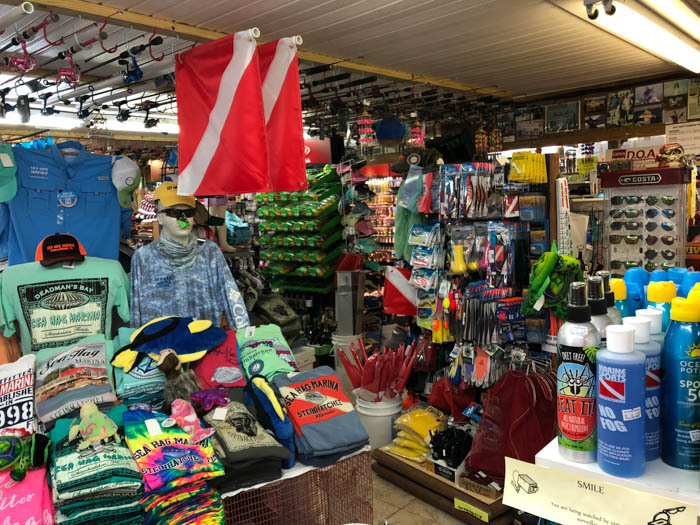 All your fishing needs can be found at local marina’s ships stores. And don’t forget souvenirs for the folks you left at home! There’s nothing like a cold beverage at the marina after a long day on the water. The final product of a busy day! Consider leaving the (messy, stinky, gooey) job of cleaning your catch to the pros! 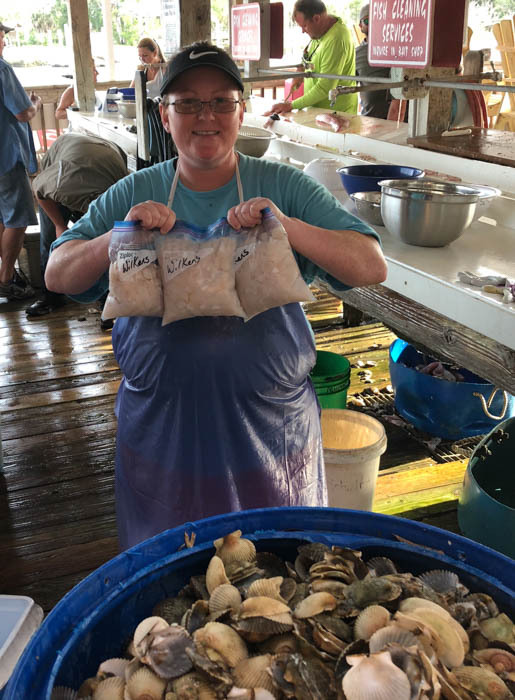 Kim is one of the many scallop cleaners at Steinhatchee’s marinas who, for a fee, will clean, rinse and bag your catch while you have a cold beverage.